One dollar from each item sold goes to support the work of Morris Animal Foundation, a nonprofit organization that invests in science that advances veterinary care for companion animals, horses and wildlife. Click the logo for more info. Support research and raise awareness. 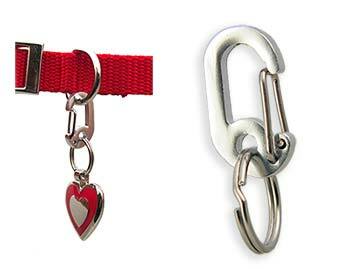 Brass or stainless styles and sizes for every pet. 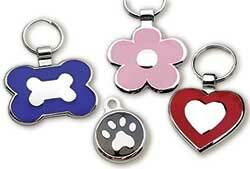 Colors, styles and sizes for every pet. Silent but effective. Also available in plastic. Either way, we have lots of shapes, styles and colors to choose from. Exclusively ours- unique. Most with color matched 3M reflective on the back for added safety. Available in neon and in glow-in-the-dark also. 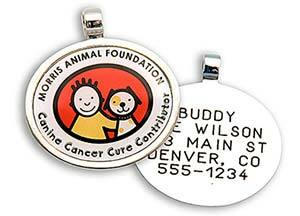 A colorful plastic frame with rounded edges add a new look stainless and brass tags. Again, our own exclusive design. 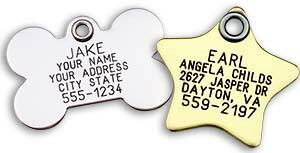 Need to move tags between two collars? 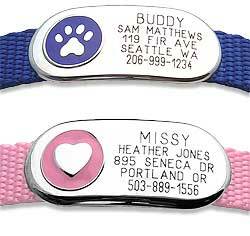 Your life just got easier with these neat tag clips. Work great for keys too! Nylon with contrasting embroidery. 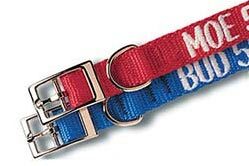 Size and colors for every pet. 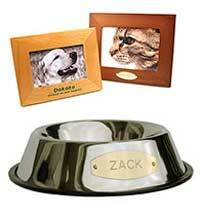 Custom food bowls and laser engraved wood picture frames make great gifts, for you pet or you friends with pets. Frames make great memorials.